This is a wall map that ships in a tube so it has no creases. A two sided, coated paper map (NOT laminated), it measures about 36 x 23.25 inches. Both sides now feature the whole Caribbean island chain with the Bahamas, most of Central America and the north shore of South America. 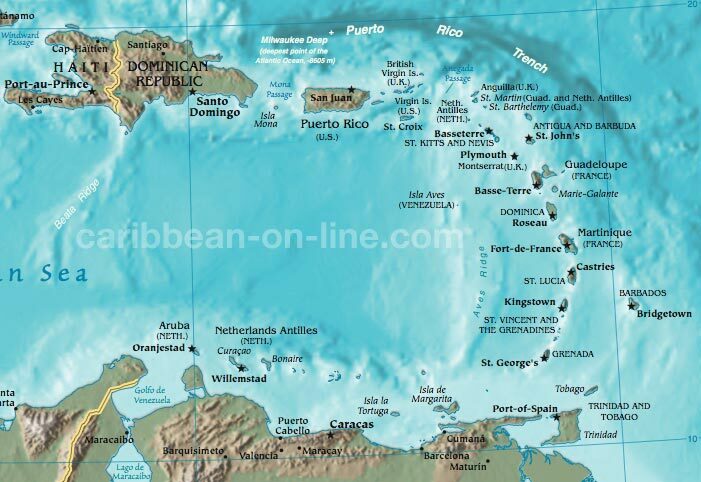 One side is in topographic/relief style, with smaller insets of individual islands and some editorial and facts of specific islands and the Caribbean region in general. See our Hurricane Blog for news and check our Caribbean Webcams page for live shots of the islands.